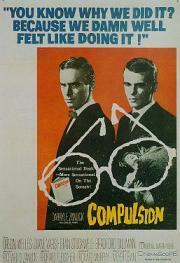 Compulsion takes a familiar story and writes a solid narrative that is superbly acted. Staus and Stockwell are pompous and darkly unpredictable while Wells strolls in with so much gravitas and in such a frumpy way. The real-life Raskolnikovs Leopold and Loeb were not the geniuses they thought they were, but nor were they dumb. The way this movie covers up their homosexuality, that's the way I imagine its heroes would have treated their guilt under investigation. Not stupidly obvious as in Compulsion's cheesy portrayal. Dillman's blatantly cocky performance is only the tip of that iceberg. The trial part, dominated by Orson Welles as the defender, is still cheesy but much more interesting and daring. Enjoyable. Dean Stockwell's performance elevated the first half although it sags a bit before the noose really begins to tighten around the main characters. Orson Welles' screen presence as "not-Clarence Darrow" steals the show, as he arrives in the final third of the movie. Mar 22, 2013 Simon M.
Great casting and amazing dialogue. Performances and the complex characters were ahead of its time as I could see this being made today. Welles has so much chrisma and an incredible screen presence that it drowns out the other characters in the film - who were fantastic prior to his arrival. Call it a minor gripe but otherwise an outstanding movie. I struggled to get into this one. Nothing about it ever really grabbed me - not even Orson Welles' entrance, which is nice but not that nice. However, I love Dean Stockwell, so that made this more enjoyable. Pretty good. Not the most exciting film in the world, but it was interesting nonetheless. Orson Welles does a very good job here. A young Dean Stockwell is utterly captivating as not-Nathan Leopold (who's also, obviously without realizing it, playing an eerie premonition of Dylan Klebold). The camerawork is terrific, Fleischer is always able to fill multiples planes of a very long canvas. It bites Inherit the Wind, Anatomy of a Murder, and 12 Angry Men (one scene with a pair of glasses is very close to the latter) pretty hard, but it comes into its own when Welles shows up. Impressive telling of the Leopold-Loeb murder, exceptionally well performed by a first-rate cast, and filmed in beautiful black-and-white CinemaScope. Top billed Welles doesn't appear for the first hour, but his performance is exemplary, especially during his stunning summation speech. Marshall is reliably slimy as the velvet gloved opposing council, and Dillman and Stockwell are excellent as the killers. Fascinating exploration of homosexual subtext as well. Uneven but still engaging, at least up until the courtroom scene and especially Welles' monologue which brings the movie to a grinding halt. What was supposed to be sympathetic and heartfelt comes across as just whiny and preachy. Political stance aside, Orson Welles ten minute closing statement is a schmaltzy and cliched ranting. I'm a champion of Rope, but I'd rate this one above it. It sticks closer to the real story, explores it in greater detail, and goes deeper into the psychology. And Stockwell is a far better "Loeb" than Farley Granger. The best stuff involves the period just after the murder, with the boys trying to outwit the police; there were tense moments where I simultaneously wanted them to escape and get caught. It slows down quite a bit for the trial, although Welles' final monologue is brilliant.